You're not going to like this letter but you like robust feedback. One of the things I liked about the way you got the meeting going was when you spoke directly to Alex Swney and told him you respected what he was doing with 'Heart of the City'. You reflected and said, "we don't care enough about enough in this city..."
Enjoyed Brenna's feedback presentation. I can imagine how much effort went into smoothing out the wrinkles. You clearly liked the fact that 83% of the feedback was positive. Well. The public like what they see on Wynyard - and most were duped by the glossy images in the coffee table publication you put out. A few of us understood enough, saw behind the pictures enough, and cared enough, to put in submissions of concern about the 1989 Port-Expansion plans that were buried in there and the hasty Cruise-on-Queens plans. These concerns did get a mention from Brenna. What also got a mention was the Peer Review you had done by Arup Australia of your Waterfront Development Plan consultation process. This has to be a must-read. I saw there in the fine print of Brenna's presentation on screen that you guys got a 'tick' for heritage and stuff, but you got a 'cross' for environment and leadership. That must've come as a bit of a shock to the Board. After Brenna we had Henry Crother's excellent work on Wynyard's public spaces. And then Queens Wharf by staff member John Smith who I remember well from my time at Auckland Regional Council. Then Westhaven. And then questions. And statements. It was pretty much sitting room only in the Floating Pavillion which had gently rocked us all throughout. Not to the point the Bircher Muesli was threatened, but a few of us were a bit seasick. Jasmax Principal, Richard Harris made the ballsiest statement. It was ballsy because Jasmax have been retained to do the Queens Wharf Shed 10 Cruise Ship Terminal design. You hardly every hear from contractors, or would-be contractors, in an environment like that. Don't bite the hand that feeds you. But these are the guys who know their onions. And they care. But there is a sort of misplaced code of ethics that shuts most of them up - just when you really need to hear from them. So we heard you Richard. Richard said loud and clear that the Waterfront Masterplan was not an Integrated Plan - because it had not properly considered the Port Expansion plans. His was a leadership statement. I hope you heard what Richard said, Bob. Really heard. Because if you didn't you're in the wrong job. Greg McKeown also asked you a question, Bob. But you didn't really answer it. Greg started by saying he was heartened by your sympathetic words recognising public concerns about the Port plans, but that he couldn't quite reconcile those words with the technical papers and policy positions on your website. I don't think you heard what Greg was saying. He is always polite. Or maybe you decided to smile and move on. But you're not a man averse to a down-trou, so I'll say it plain. You're being two-faced about the Port, Bob. Is that your Board's position too? But the Port isn't the only elephant. In Brenna's presentation the Waterfront Forum was advised that Queens Wharf Cruise Ship terminal Resource Consents would be 'granted in July 2012'. I used my question to ask John Smith what consents were being applied for, what the process would be, and whether the applications would be notified. John told the meeting that discussions were occurring with Council staff, and that he would get back to me when he had more information. I have to tell you Bob, that I was somewhat disappointed to hear this. You praise the planning work that delivered what we see at Wynyard. You probably know that Auckland City Council and Auckland Regional Council sweated blood over the plan changes and resource consent applications and public hearings that hammered out the planning framework for what we see today. So John's answer to my question should concern you and your Board. It's shonky. Bit like that stormwater pipe in Glen Eden. Shonky. You guys are planning a major change in the use of Queens Wharf (Cruise Ship Terminal), with a whole pile of different environmental effects (traffic on Quay Street, passengers in buses and taxis, conflicts with public access - all different from before), without going through due process. Would you allow a private developer to do what you plan to do with Queens Wharf without a decent set of resource consents and conditions? Auckland Council is the other elephant that was in the room yesterday. The biggest elephant in fact. Show your board and Auckland some leadership Bob. Then we'll give you a 'TICK'. During the last few days New Zealand has remembered the Christchurch earthquake. Printed media, radio and television have been full of reminders. Though people who live in Christchurch won't need much reminding because of the personal memories they will carry for the rest of their lives. It is important that we - the people and our public institutions - don't forget this time. 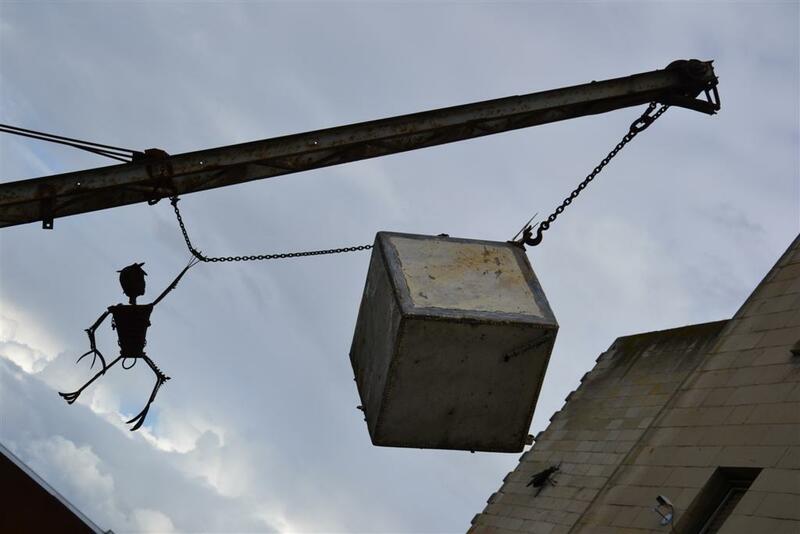 We have quickly forgotten earthquakes that ravaged North Canterbury since European settlement, and failed to learn the need to minimise earthquake risks to people and property. 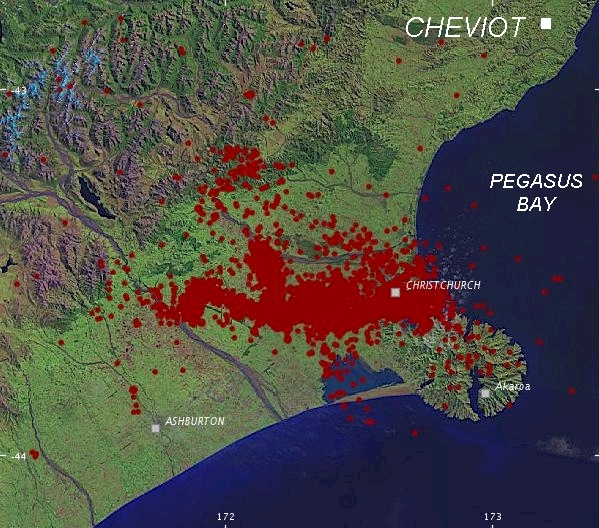 Nobody alive today has any personal memory of the earthquakes that struck Cheviot over one hundred years ago, beginning with one estimated at 6.9 on the Richter scale on Saturday, 16 November 1901. But newspaper archives reveal stories that resonate today. Or should do. Because Cheviot is located amongst the same cluster of small faults that are causing earthquakes now in Christchurch ..
Issue 7255 of the Star, dated 16 November 1901, carried its first 3 stories about the first sequence of Cheviot earthquakes on page 5. It was a Saturday when the earthquake struck. It's worth remembering that over a hundred years ago, Cheviot was just being settled. Transport was rudimentary. Colonial life was hard. And telecommunications within New Zealand were sparse. "...It lasted several minutes. There is not a brick building or chimney left standing. The windows in many houses were shattered to atoms. One little child was killed by a falling house. The bakers' ovens are smashed to pieces and everything in the district is a complete wreck..."
The day's third story is a Rangiora based interview with someone who had been in Cheviot and seen what happened. Next Monday's Star, Issue 7256, 18 November 1901, carried seven stories on pages 3 and 4. The main story carries sub-headings: Fresh Shocks; Panic-stricken inhabitants; Preparing to leave... The other stories cover: Damage reports in Christchurch and tremor measurements; Drive through Cheviot damage reports; a wonderfully detailed account of damage in Cheviot; an 'Account of springs damage at Hanmer', a quaint account of Magnetograph measurements; and a detailed report of 'earthquake cause and locality by Captain Hutton curator Chch Museum'. Issue 7257 on the Tuesday following carried 10 stories, including a front page story reporting an average of 3 or 4 earthquakes per hour for the 24 hours following the first major earthquake. It also describes people living under flax bushes because of damage to their homes. The other stories include: a detailed account of Seismograph records in Wgtn ; an Editorial headed: Righteous Object - calling for community support drawing attention to the suffering but noting 'the government cannot do everything'; there is also a long and detailed account of the damage which refers to photos in the current Canterbury Times publication. More nitty gritty stories include: Some settlers destitute. Relief fund; and further accounts of 'Large aftershocks. Nerves strung out...'; a public relief fund emerges 'Public fund from community'; and a constructive 'Suggestion of school used for children sleeping'. The Star carries Capt Hutton again on 'Source of Equake. Size etc'. Hutton is reported as saying, "Canterbury people should be prepared for such shocks in future... they have come before, and are practically certain, sooner or later, to come again.... it is therefore of the utmost importance that every precaution should be taken to minimise the danger to life and property..."
The story was still big in Wednesday's Issue 7258 with 7 stories. Interestingly there is an account about the Cheviot earthquake pictorial issue of the Canterbury Times being sold out and a reprint ordered and advertised. A hopeful mood is reflected in one headline 'only two small shocks in the night'... Another story is of Exodus from Cheviot children and ladies taking the train to Christchurch, a sympathy message from West Australia's premier is published. However the peace and quiet is rather contradicted by another story 'the shock very much upset the women folk....' (which continues here.). The largest story is an account of the visit to Cheviot of the Hon W Hall-Jones - presumably a government Minister. This story includes graphic accounts of damage, and reports that the Government has ordered all its stock of tents to be brought to Cheviot to house homeless people. Thursday's Star, Issue 7259, only carries 3 stories. But the page 1 story describes the public meeting held in Cheviot with the Minister is very detailed. What emerges in the story is that settlers were very worried that Government might not continue to support extension of rail into Cheviot. Reading between the lines there is concern from settlers - many of them farmers - that their investments would be affected if Government did not ensure good transport links. 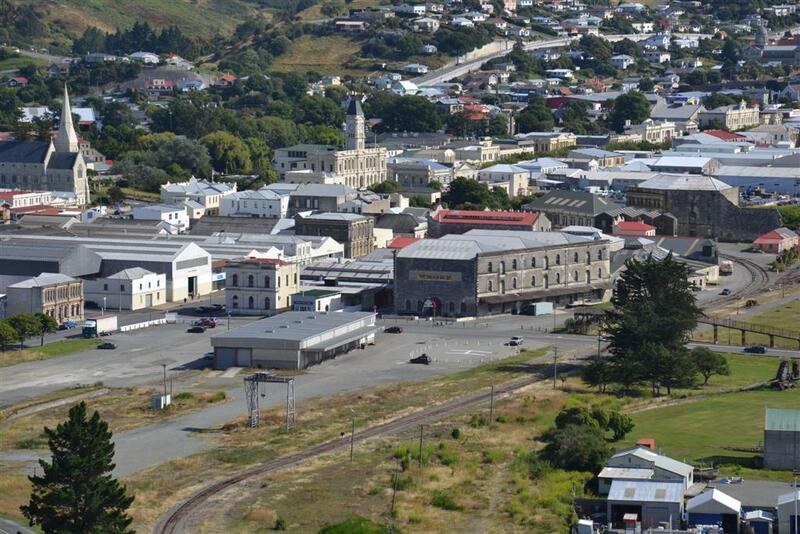 The views of settlers are reported, as is the Minister's response and promises related to the railway and earthquake relief support. The story ends with reports of a sharp earthquake. A short story headlines: Several sharp shocks, and reports on the continuing exodus of families to Christchurch. Friday's Star, Issue 7260, contains another advertisement for the next issue of the Canterbury Times, describing the photos to be seen therein. The main story covers: Personal stories with families on Train. "The Fugitives". Reporters had access to refugees arriving to Christchurch. A brief headline reports more disturbances at Cheviot. The euphemism of the day it seems. to have no "hold" at all! 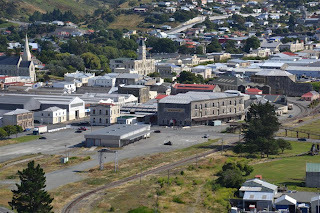 Another story gives an account of a public meeting held in Christchurch City Council about the earthquake and about funding. While another describes damage to schools in the area, especially to chimneys - but not tin ones! Monday, 25 November 1901. Issue 7262 of the Star carried 4 stories, one of which was about the next issue of Canterbury Times pictorial coverage. Two others were about continuing aftershocks. While a large story 'Facts and Theories' about earthquakes covered a lecture given by WW Collins ion the Lyceum. Tuesday, 26 November 1901. Issue 7263 of the Star carried just a single story. This covered an account from a Christchurch man claiming the Cheviot earthquake reports had been 'exaggerated' and were 'sensational'. These exaggerations were denied. Thursday's Star - 28 November - contains a graphic personal account reported from a Cheviot 'lady settler'. And a story about a further slight shock and tremors. Friday's Star reports more shocks in a story where someone blames the moon for the 'disturbances'. Saturday's Star reports on three more 'slight' shocks and lists Relief Fund receipts. Saturday's Star, in 'The Week' carries another earthquake joke. And announces that the Premier, Mr Seddon is 'in town' and will visit Cheviot. Monday, 9 December 1901. Issue 7274 of the Star runs a small story about the price of bread in Cheviot hitting 8 pence a loaf because the earthquake so seriously damaged bakers' bread ovens. Tuesday's Star is all about the Premier's visit to Cheviot. The report details his speech. He apparently spoke for three hours. Covered the rail issue - with some delicacy. He said he'd been much struck by settler comments, who told him they were gratified that the disaster had not fallen on a 'thickly populated place like Christchurch - where the result would have been awful...' There's a human interest story about him having to climb out a window because the door was jammed shut by an earthquake. And there's a small story about the Relief Fund. Friday's Star carries a story about two more heavy shakes and drizzle. Tuesday, 31 December 1901. The end of the year. The dying year editorial marks the earthquake. This story gives a good sense of what else was happening across the colony and in the world at the time. Friday, 3 January 1902. Issue 7292 of the Star reports a Severe shock at Cheviot. Booming all night. Tremors. New chimneys down (but not the tin ones). Saturday, 4 January 1902. The Postmaster's report notes further tremors. Star , Issue 7325, 11 February 1902, Page 3. Local and General news that railway works at Cheviot have been halted. Meetings held. Resolutions passed. Star , Issue 7327, 13 February 1902, Page 3. Story notes new shock, and that Govt has put up 1500 pounds as its share of relief fund. Star , Issue 7330, 17 February 1902, Page 3. Story reports on account of Cheviot earthquake by Government Geologist. Star , Issue 7343, 4 March 1902, Page 2. Story reports more thoughts of Captain Hutton on Origins and Causes of Cheviot earthquakes. Star , Issue 7353, 15 March 1902, Page 1. A rather odd story about volcanoes and liquefaction. Star , Issue 7358, 21 March 1902, Page 3. Sir Joseph Ward visits Cheviot and is shown over the wreck of Mansion House. Star , Issue 7394, 5 May 1902, Page 4. Odd story about rumours of booming and quakes that didn't happen. Star , Issue 7399, 10 May 1902, Page 5. 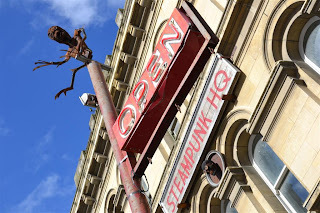 Local and General story reports 'sharp shock' at Cheviot. Star , Issue 7450, 10 July 1902, Page 2. 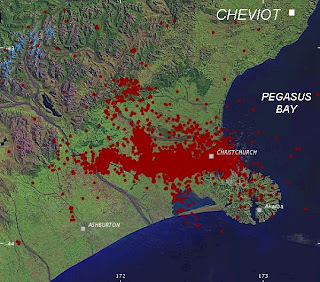 This substantial story reports a government geologist 'pamphlet' on the 'seismic disturbances at Cheviot' and contains extracts from it about the origins of the Kaikouras. Star , Issue 7437, 22 August 1902, Page 2. The Editorial praises the Children's Aid Society, and notes its role during the Cheviot earthquakes. And that was the year of earthquakes for Cheviot and its settlers a little over a hundred years ago. 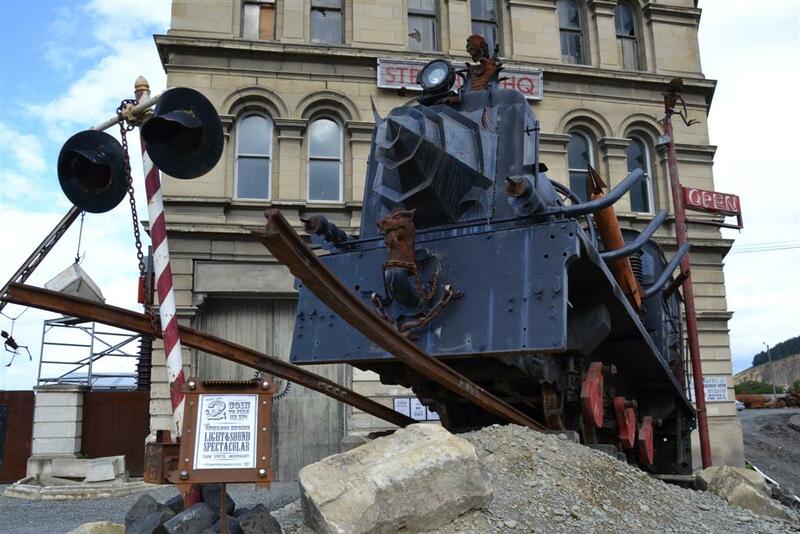 This sculpture in the heart of town suggested a few things had changed. 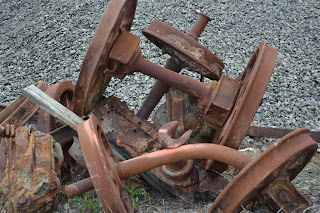 The wheels on this thing are tractor wheels - which gives you some idea of its size. The sign on it gives an idea: "STEAMPUNK". But what is Steampunk? 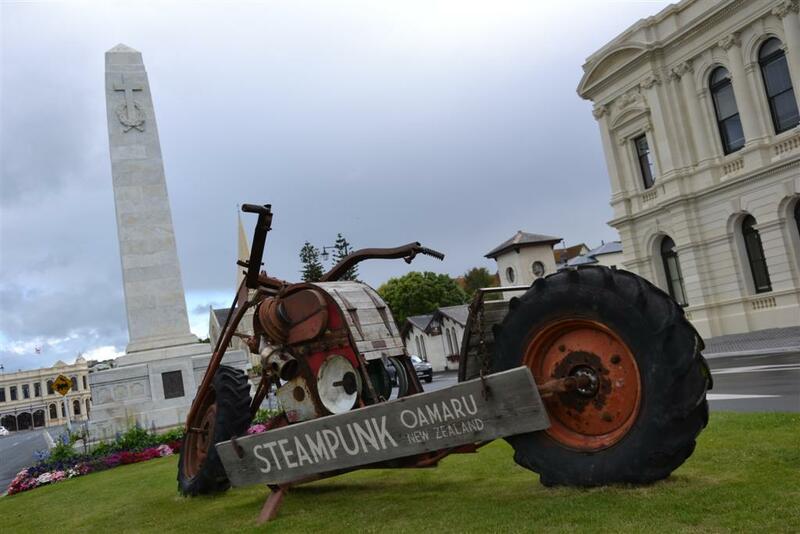 Where did it come from and why here in Oamaru? 'Steampunk is “tomorrow as it used to be”, fantasy. The “punk” in steampunk is a rebellion against the present day preference for plastic and the disposable way of life. For many it is a search for where society might have taken the wrong turn at the end of the Victorian era. 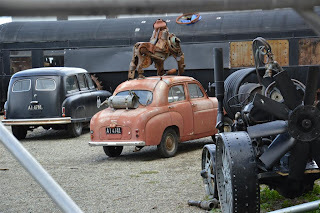 The punk era of the late 1970's and early 1980's gave rise to a group of science fiction authors who set their plots in the Victorian world.“Steampunk” was coined to define their type of sci-fi. It is set in a world where steam was the primary source of power, where everything was considered possible and expantion was the norm. Empires were built, new areas of the world taken over and why not go into space? – but at what cost to society? Significant influences were H.G. Wells and his time machine, Jules Verne and 20,000 Leagues Under The Sea and Alan Moore's super heros in The League of Extraordinary Gentlemen. The backyard was full of unlikely exhibits. Given my Dad used to sell Vanguards and Standards it was a bit of a blast. He also sold Ferguson tractors but this was no Ferguson. The skyline was full of interesting scuplture. The fly on the wall (get it) was half a metre long. Quite a lot of creativity in evidence. This old engine had been recovered from sea defences along the coast. Today the Little Blue Penguins seem to run the show. A few years ago they had confined themselves to a tiny corner of the waterfront (dogs and stuff), but now they treat the whole waterfront as their home, and late evening they are everywhere. Tourists are encouraged to walk carefully for fear of kicking them. The whole place has a very unusual and interesting feel. The place is alive with the kind of creativity that we - in Auckland - could learn from. I wonder what sort of Post-Apocolypse we might be emerging from on our waterfront? 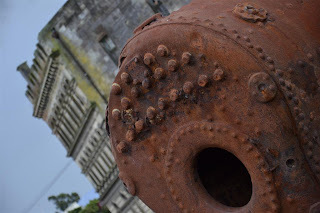 FOSSILPUNK maybe. INDUSTRIALPUNK anyone....? Tourists seem to love it. I had to join a long queue to get these pictures. Old bogies thrown around like toys. Mayor Len Brown wrote the 15th February Strategy and Finance Ctte report entitled: "Rates Transition Management Policy – alternative option". He's the signatory, and he writes: "In discussions with many of you, I have heard the concern that the transition policy as it stands has real limitations. On your behalf I followed up with officers over the Christmas break and their work has identified that relatively minor legislative change would enable more flexibility and, in my view, a fairer approach...."
The main reason this change is happening is because Council has adopted a reasonably pure General Rate capital tax on property value (land value plus improvements). Mayor Brown has stated, "under the new rating system a $400,000 home in Manukau will pay the same rates as a $400,000 home in North Shore..." The scale of the change is such that Council is concerned to spread the impact of its policy change over 2 or 3 years. However, the household whose rate increase is - say - 30%, will be paying 30% more rates than now, eventually. Because of the policy. But there are questions to be asked over the rightness of the policy. Is it necessarily the best policy to say that every $400,000 house should pay the same rates? It is a sort of egalitarian ideal after all. But are there fishhooks that should be explored and understood. I think so. Problem one. The problem of choice. Not every household wants, or needs, or can afford the same Council services. You can see this in how Auckland has developed. There are distinct areas, with distinct services, differences in council service levels, and different costs of living. Utopianists may want to iron out those differences. But the price of that uniformity can be the removal of diversity and difference, and the removal of real choice for those who want it, and those who need it - through no fault of their own. Do we really want Auckland's differences to be smoothed over through rate harmonisation to the extent that Auckland turns into Brisbane? Or is it more a Sydney flavour - with all of that diversity and difference - that we want. Beware what you wish for. Problem two. 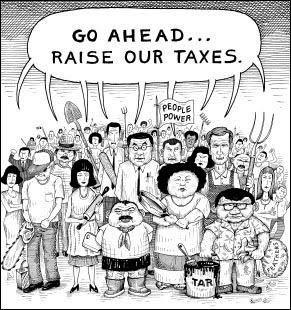 The problem of a "tax on a tax". Parts of urban Auckland that are 50 years old and older have greater public amenity, and higher quality public amenity than newer parts of Auckland. (More parks and pocket parks, library services, better maintained berms and footpaths and cycleways, community buildings, clubrooms, sportsfields, restored streams, and such like). These public community assets have a value which is reflected in private property values. They were paid for by rates, year on year, asset by asset, and form an accumulation of community capital. Is it right to charge rates again, on that accumulation of rate value? Perhaps it is. New Zealand may not have adopted a capital gains tax yet, but a pure General Rate is in effect a capital tax on property value. In part it is a tax on a tax. Problem three. The effect on rents. About half of Auckland households live in rented accommodation. Typically the landlord (who is interested in the long term value of that asset) pays the rates, while the tenant (who is generally interested in shorter term use of the asset and services such as rubbish, wastewater) pays the rent - which covers the landlord's costs. I estimate that about 20 to 30% of rental revenue is expended in council rates. However the rental market has already taken a hit with the removal of depreciation as an allowable loss for tax purposes. I would suggest that most rental property is located in parts of Auckland which will experience the greatest increases in rates. This will translate into inevitable rent increases. "Report of the Local Government Rates Inquiry: At the beginning of the Inquiry the Panel undertook to deliver to you by 31 July 2007 a high-quality report based on wide consultation and sound evidence and analysis. We are pleased to deliver our report, which comprehensively addresses the wide range of issues covered by our terms of reference. Our report identifies many significant issues and proposes many significant changes. We acknowledge many strengths in the existing system of local government funding, but have not adopted a “business as usual” approach. This is a report that creates an agenda for change that needs to be pursued by central government and local government in partnership with other stakeholders...."
57. The Panel favours the promotion of a common system of valuation for rating purposes and strongly favours the capital value system because of the closer relationship of capital values with household incomes. 58. The Panel considers that, in fixing their overall rating policies, councils should have regard both to services consumed and to ability to pay. The changes that it recommends above would likely change the distribution of the burden between commercial and residential ratepayers and between different residential ratepayers. 62. The Panel also recommends that councils make more use of their flexible rating powers so that the rating burden better reflects value in use, rather than potential sale price. The devil is in the detail when it comes to any form of rating or taxation. There is no silver bullet. However I would suggest Auckland Council spends at least as much time considering flexible rating systems that will reduce the rate change impacts listed above, as it is in trying to lessen the impact by spreading it over a longer time. Argentine ants (Linepithema humile) are one of around 28 introduced ant species in New Zealand. 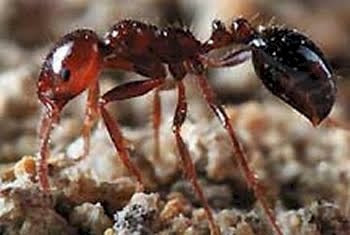 They are very aggressive and can eliminate other ant colonies, and also destroy and eat other insect species and earthworms. These invasive species pose a great threat to many forest floor invertebrates that have evolved in a land without aggressive ant species. 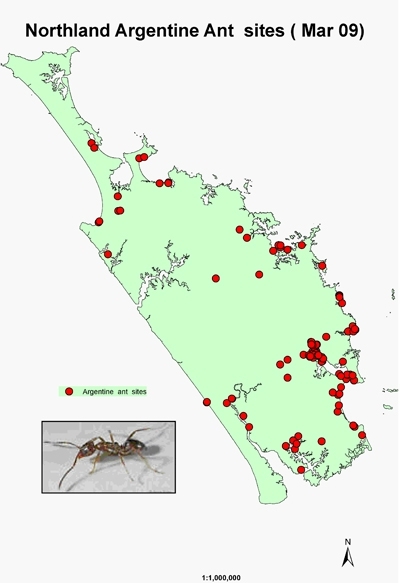 Although they breed prolifically, Argentine ants do not fly but walk to establish new nests. This means that they do not spread rapidly, but an infested site has a very high number of ants and colonies which merge into one vast super-colony that extends over a very large area. Their natural rate of invasion is a few hundred metres per year. We have a bach at Mangawhai. Had it for a few years. About two years ago I began to notice there were different coloured ants about. We had already dealt to the usual NZ black ants (using the liquid they collect and take back to their nests), but these little reddy-brown buggers were different. For a start they can bite. As you can see on this picture, Argentine Ants are surprisingly small. But they can deliver a sharp bite. When I was an ARC Councillor (2004-2010) we periodically received advice about Argentine Ant infestations. I recall the main infestation of concern was on Great Barrier Island, in the Gooseberry Bay area. 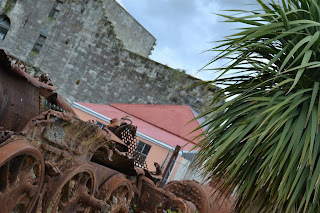 At the time it didn't occur to me that there were infestations on the mainland. I contacted ARC and Northland Regional Council after doing a bit of research, because I found that it was possible to obtain Argentine Ant control chemicals for free. Apparently a deal had been done with Department of Conservation, which was concerned about the spread of this pest into forests. I was informed that free Xtinguish (the recognised control) was no longer available free. You can get it on TradeMe from Ant Busters. But it costs $40 for 100gm in a sort of syringe like applicator. Rather than buy Xtinguish I experimented a bit with fly spray and generally made myself unpopular with the local ant population. However I soon learned they could set up nests anywhere and everywhere, and no sooner had I dealt to one nest, then it would somehow develop into several nests. I found out about multiple queens and all that stuff. Argentine Ants form nests in the lawn, in gardens, in trees, under the door mat, at the top of verandah posts, and anywhere inside a building. Listening to the marine radio a few months ago - the one that gives the tides and wind speeds and marine forecasts - I was intrigued to hear a message to boaties to make sure there were no Argentine Ants on board their boats before they headed out, potentially to stop for a picnic or for a spot of diving, at one of the many islands in the Hauraki Gulf. I was well aware from my own experience how it only takes a blade of grass, or a drooping branch, and a few hours, before you have a resident group of Argentine Ants on board your boat on its trailer. 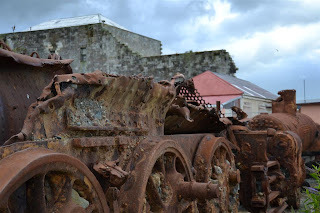 This Christmas a mate came to visit from Devonport, Auckland, brought his boat up, and was surprised to find it crawling with ants the next day. He was only aware of the risk because we'd been talking about it the night before. 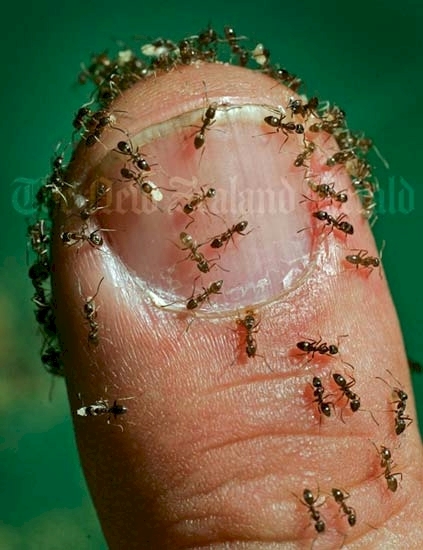 These ants are tiny - about half the size of your typical NZ black ant - and innocuous looking. You have to be very aware of them to notice them at all. They are also spectacularly invasive, organised, and voracious. 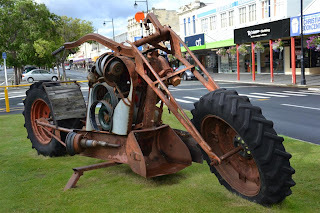 I've no doubt there are significant infestations in parts of urban Auckland now. These will grow unless checked, and become a more serious problem for Aucklanders and the environment. In January I finally purchased a 100gm tube of Xtinguish. The advice is to lay blobs about the size of what you put on a toothbrush, outside every two metres square or so. I have to say it has been very effective. So far. For our property. But I am aware that neighbours are also infested. The risk of widespread infestation of Auckland from Mangawhai must be high. Should this invasion worry us?